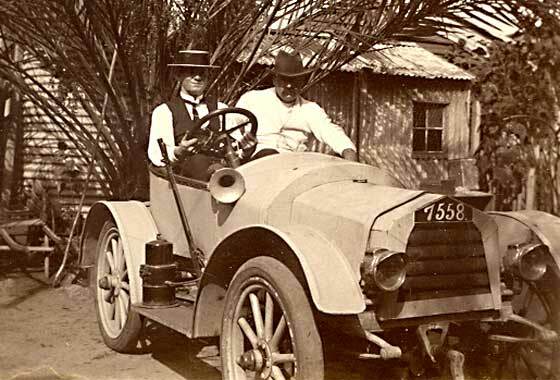 Puzzling photo from Philip Riedel, Adelaide (Australia) found in a family album possibly taken in Port Augusta, and perhaps a 1916 Darracq? -- Darracq features to front, but of very much earlier car. Amateur body of c1913 style. Our Rory Sinclair advises: This picture was reproduced in The Sporting Car Club's South Australian Motoring History Book No.11 by George Brooks, page 5 (1996). It is a modernised 1903'4 8hp single cylinder Darracq which belonged to a Mr J T Whellum of Port Pirie (Aus). 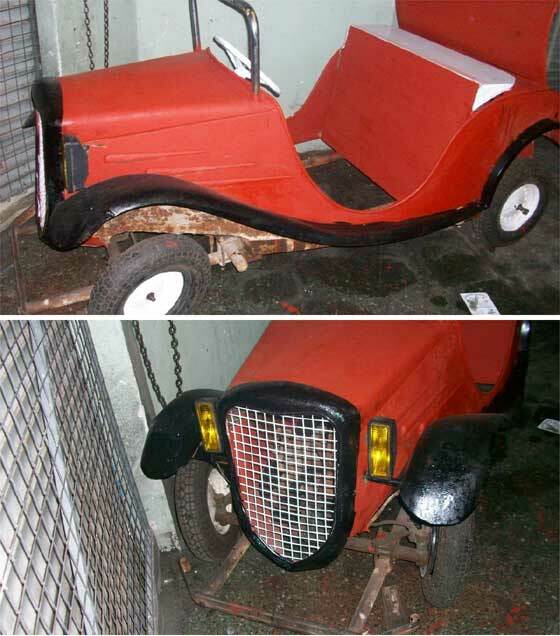 Photo from Philip Riedel, Adelaide (Australia) who is planning restoration of two incomplete 1905 De Dion Bouton Model AB 10HP Twins after 30 years. Had contact with Hans Compter of Melbourne who provided the photo of car chassis 529 being restored by Mr Joel Fortin in Tours France; body now believed lost in fire. Two ABs known, one in Lyon and one in Sclumph. Philip is seeking contact with any AB owners and especially Mr. Fortin if he reads this. -- We will pass on any info. This is a section of a (UK) greetings card showing the front of a car with a very obvious logo, but what was it? -- The car is very American and has a tall pointed radiator typical of American cars of the period. Although the logo was obvious and repeated twice, I was not able to make it out. Slanted script embossed into the radiator metal and at first we got it wrong as an Overland, until Ariejan Bos contacted us from Holland telling us it was a cca 1911 Oakland 40 Sociable Roadster. 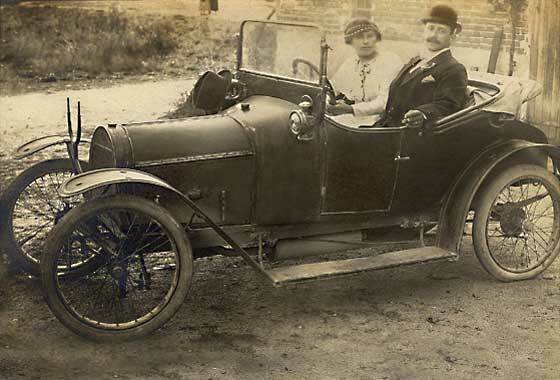 Intriguing photo received from Daniel Monard (France) who asked if we could help with identification of this car. No further background supplied. -- Although I knew I had recently seen the transverse spring, my system did not come up with an answer, but John Warbuton pointed me in the direction of the article in the April edition of The Automobile. This is a cca 1913 CID Baby on which I did an item in 2010 on Help Page 21. Sold in England, including the Emeraude with semi eleiptic springs. Photo from Ivan Baranrsev (Russia) saying lorry was named in Russian mag as Russo-Baltique Type K 12/24, but he feels BRs did not have this type of rad. -- Regret no positive ID on truck. Sharply sloping bonnet was a Teutonic fashion but some RBs did also have them. David Venables advised the plane was a brilliant Sikorsky "Ilya Mourometz". About 80 made 1914-17 and many had Argus engines, looks like an Argus on lorry. It was made by ......the Russo-Baltic Wagon Co of Riga! Request from Jonathan Daniel from Pittsburgh (USA) whose friend has a family website with a number of car pictures on it. The cars were used in Franklin, Pennsylvania, USA. Could we help in identifying them? Says "What a great site you have! " -- Thanks for the compliment, much appreciated. The first is relatively easy. 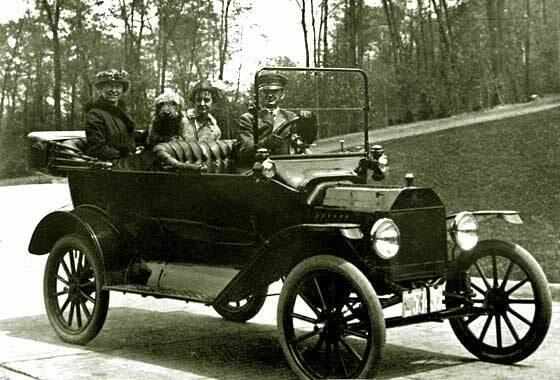 Transverse spring, rounded side lights, narrow edge to the radiator, square edged bonnet, all suggest this is a cca 1915 Ford Model T Touring. Interesting suspension. Photo received from Gerard McSweeney (UK) who heard of us via the Genealogy in Hertfordshire site. 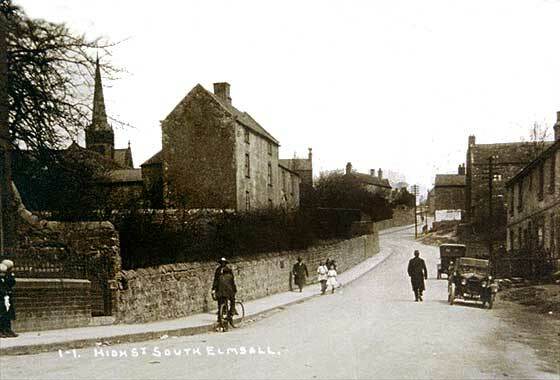 He would like to know the date this rather poor photo was taken from a local history point of view. Number should give an approximate idea. -- Registration AR 7486 was issued by County Council of Hertford but their records are incomplete; post 1910 and pre 1921. 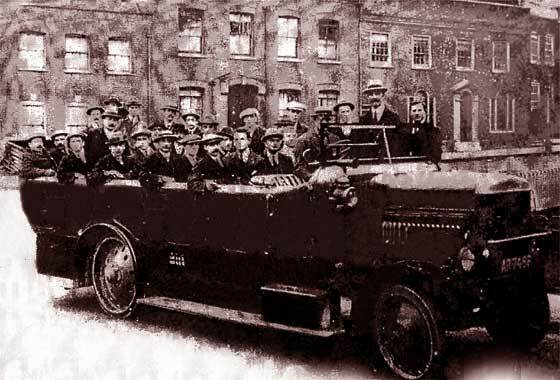 Relatively sure this is a cca 1916 Leyland RAF lorry converted to a charabanc after hostilities ended, & registered cca 1919. Very small fuzzy blurry photo received from Terry Reeves of Bridlington (UK) asking for help with getting to a close date. Could the car be a Post WW1 Crossley?-- Too small. We asked for a better resolution photo but got no reply ! Not a Crossley; wrong rad. Reg seems WY 2###, so Yorkshire late 1922. Lower windscreen infill and bulkhead sidelights suggests the car to be a cca 1922 Wolseley 15 Open Tourer which appears to be damaged as it seems to have no offside front wing. Three more photos received from Roy Edgar (UK) who heard of us via the 'Who Do You Think You Are' Genealogy Exhibition at London Olympia. 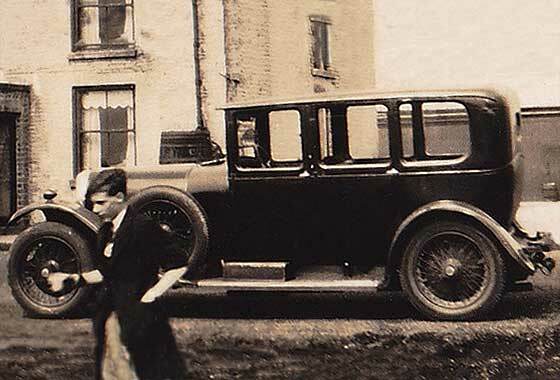 This one shows a formal limousine and is titled 'Family car c1930'. -- Unfortunately the registration is not visible so cannot help in dating. A number of our experts agree that this is a 3L Bentley. Made '21-29 and body is good match for Freestone and Webb whose works was near Cricklewood where cars were made, rather than Van den Plas. Request from Jonathan Daniel from Pittsburgh (USA) whose friend has a family website with a number of car pictures on it. The cars were used in Franklin, Pennsylvania, USA. Could we help in identifying them? Says "What a great site you have! " -- Thanks for the compliment, much appreciated. Seems they changed to Buicks and stuck to them. Difficult angle but our friend Lief spotted the make. 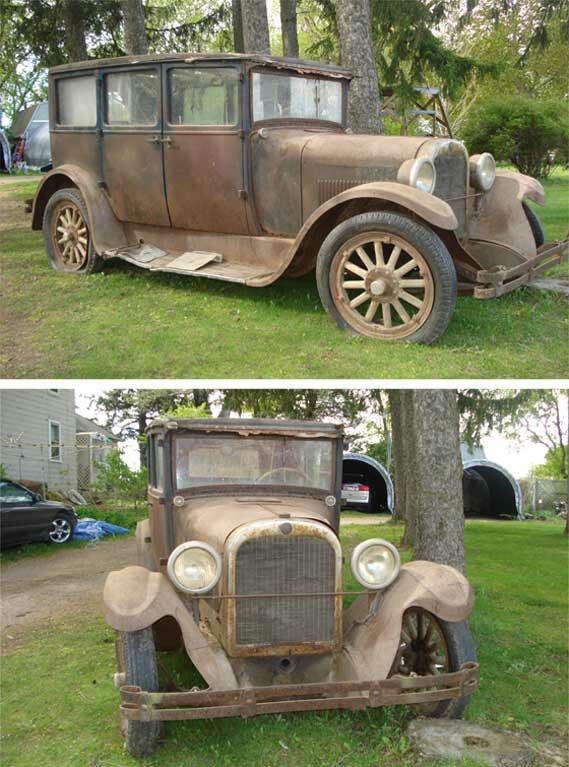 This looks like a cca 1925 Buick Master Six Enclosed Touring, touring bodies but with fixed tops. Nice photos received from Debbie Clark (USA) taken in Wisconsin who is trying to identify the model and year and get approximate idea of the current value. 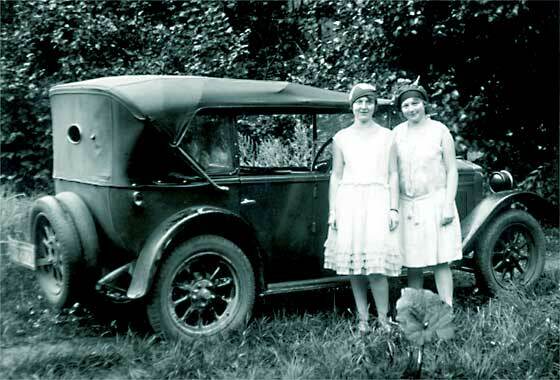 -- Our friends at the AACA believe it is a 1925 Dodge or later. The 1925 had the cowl vent. If the serial number on the toeboard is between A-132,707 and A-372,474, it is 1925. 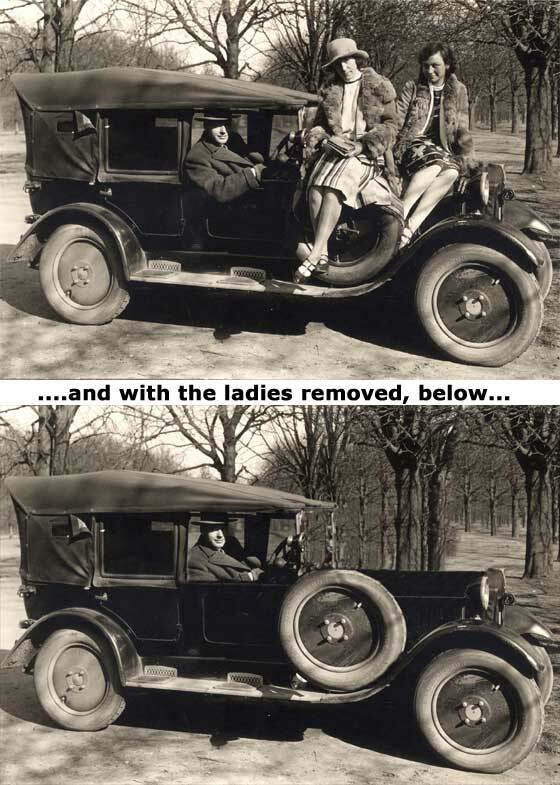 Car actually looks to be 1926. Not valuable; maybe $1,000 broken for parts. If not rotted badly and able to get running, maybe $2,000. Better get professional value ! Three more photos received from Roy Edgar (UK) who heard of us via the 'Who Do You Think You Are' Genealogy Exhibition at London Olympia. This one shows a 1928 Oldham registration plate. -- BU 4067 is indeed an Oldham CBC registration. The car is quite interesting for Oldham as it was made in America and seems to be a couple of years younger than the suggested registration. 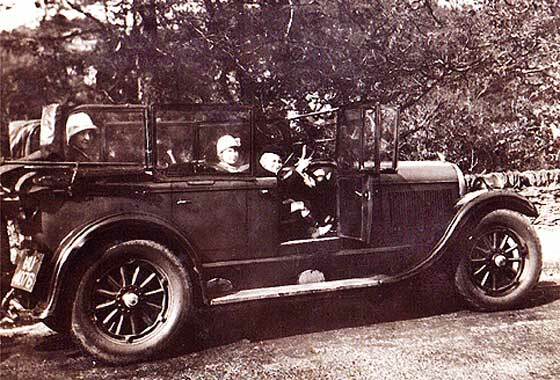 Multiple hubnuts suggest this is a cca 1926 Chrysler G70 Tourer, made 2 years after company started. Another photo received from Raoul Rainer from Stuttgart (Germany) from a batch of 1920s/30s photos he purchased on-line recently. Do we have any idea what it could be? 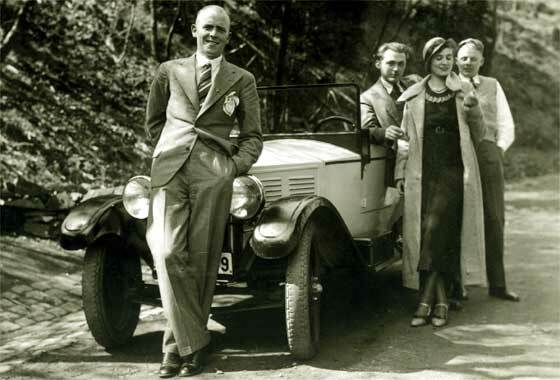 -- High small door and horisontal bonnet louvres help, but the giveaway is the transverse front spring, which makes this a cca 1928 DKW P15 Cabriolet. 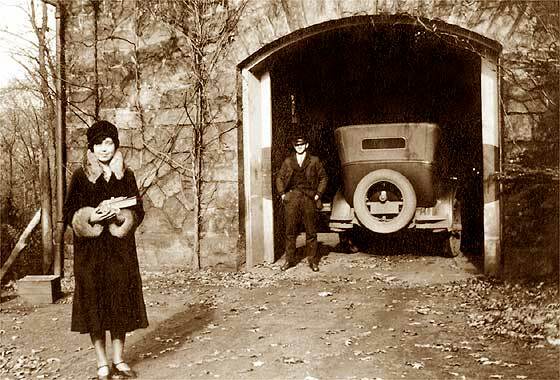 Later post 1931 cars had front wheel drive. Engine was 600cc, two cylinder, two stroke, 75 KPH. DKW became part of Auto Union in 1932, became Audi, is Volkswagen. Another photo received from Raoul Rainer from Stuttgart (Germany) from a batch of 1920s/30s photos he purchased on-line recently. Car looks American but phographed in Germany. -- Actually it was made in Torino, Italia. Looking at the bonnet there is an additional bodyline strip at the top of the side of the bonnet which suggests this us a later cca 1929 FIAT 509a Torpedo. 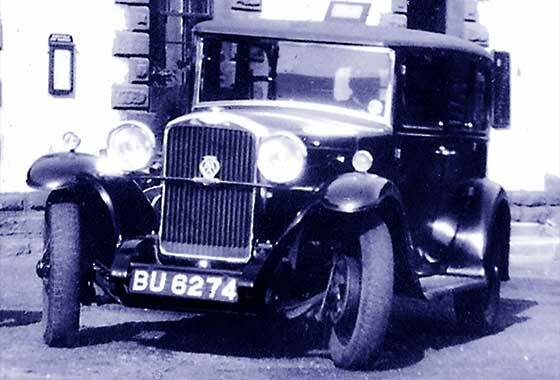 The 509 range was made between 1925 and 1929, 990cc 4 cylinder, 22 BHP at 3400 rpm and a top speed of 48mph. Three more photos received from Roy Edgar (UK) who heard of us via the 'Who Do You Think You Are' Genealogy Exhibition at London Olympia. 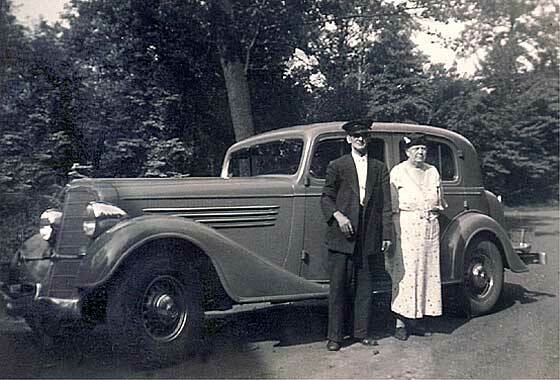 This one shows a saloon in front of the Snake Inn and is titled 'Family car c1932'. -- BU 6274 is Oldham CBC late 1929. Some of our experts thought this a Humber Snipe but I had reservations as radiator core top is curved and bonnet hinge not correct. Further investigation had since determined that this is actually a 1929 Hillman 14 HP Saloon. 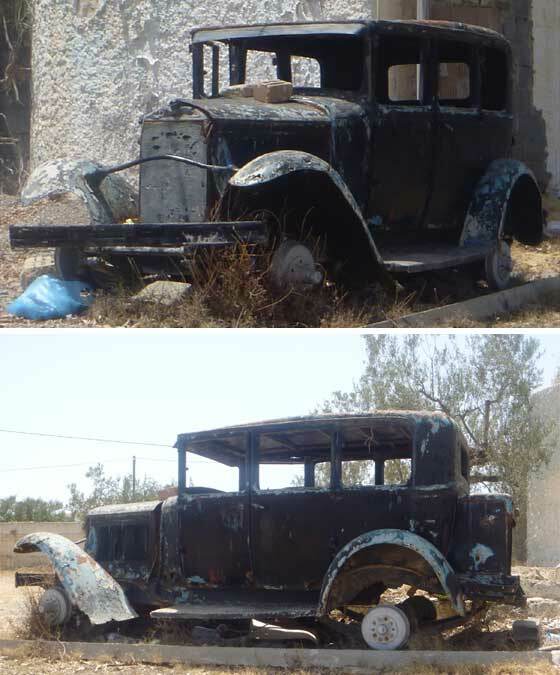 Couple of photos from Peter Schipof, Amsterdam, (Holland) of a car found in a desolate spot in Tunisia. They wondered what it was. Friends suggested Citroen Rosalie, Auburn, Erskine and Peerless. -- Quite near the mark with the first suggestion. Pointers are 33 louvers with a gap to the front and forward pointing back to bonnet, triangle pressing to the sun visor, bulbous headlamp mounts slightly inbord on bar, circular back/side catches to square boot, five stud wheels:cca 1930 Citroen C4. 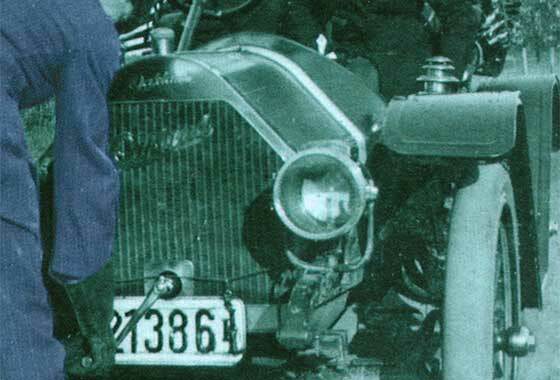 An enlarged part of a photo received from Benjamin Derhy (France) asking for our help in identifying the car which was photographed in 1935. He is sorry for showing so little of the car. He has noted many cars on our Help Pages but does not believe they were exactly the same. 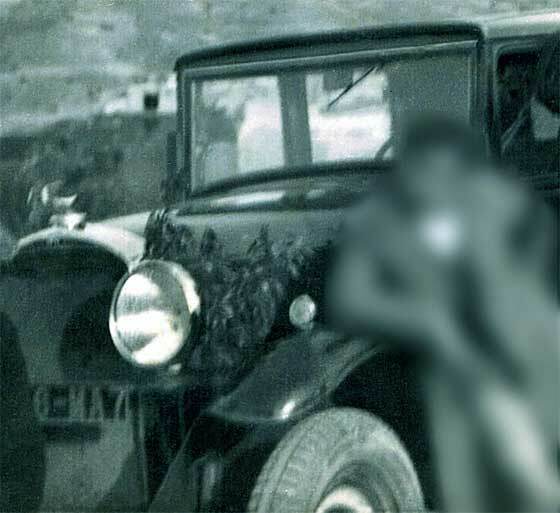 -- It is a little difficult to make out the details of the car even when the photo was repaired and enlarged, but from roof front and one wiper, we are relatively sure we this is a cca 1930 Peugeot 183C Saloon. Three more photos received from Roy Edgar (UK) who heard of us via the 'Who Do You Think You Are' Genealogy Exhibition at London Olympia. 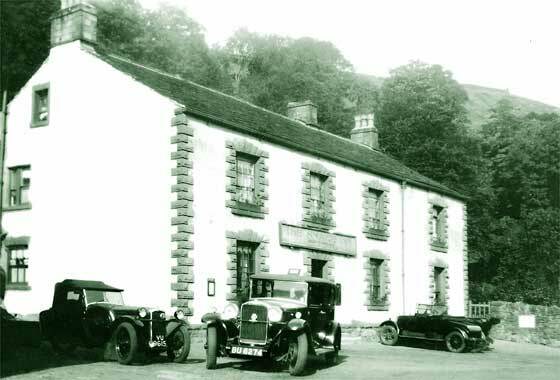 This one shows the Snake Inn c1932 and relates to the cars left and right. -- Car on the left registration VU 9615 was registered with Manchester CBC. This is a front wheel drive three wheeler, being a 1932 BSA Sports, which featured Hotchkiss designed 900 air cooled V-twin 1021cc. Car on the right is a mid 20s Bullnose Morris Cowley 2str. Photos received from (Argentina) saying he has purchased Rytecraft Scootacar in pretty bad shape and is planning to restore it. It seems the car was bought over by previous owner's grandfather from Hungary in the 1940s. No documentation came with the car so exact year of manufacture is not known. -- We had done an in-depth study into Rytecraft Scootacar in 2001 and can add that one of our founder SVVS Members had done round the world trip in the one at Brooklands. Request from Jonathan Daniel from Pittsburgh (USA) whose friend has a family website with a number of car pictures on it. The cars were used in Franklin, Pennsylvania, USA. Could we help in identifying them? Says "What a great site you have! " -- Thanks for the compliment, much appreciated. This one is little more difficult but follows the Buick theme. Four bar bonnet louvers, chrome headlamps, only two windows per side, twin external horns; all suggesting a cca 1935 Buick 60 Club Sedan. Request from Jonathan Daniel from Pittsburgh (USA) whose friend has a family website with a number of car pictures on it. The cars were used in Franklin, Pennsylvania, USA. Could we help in identifying them? Says "What a great site you have! " -- Thanks for the compliment, much appreciated. Seems they liked Buicks. 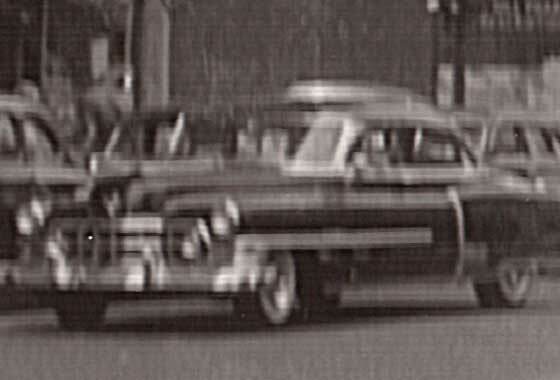 This one is difficult to see being in the dark so we are guessing it is a sedan. Grille looks like the cca 1941 Buick Special Sedan but as not visible, difficult to be precise on model. Enquiry from Ian Prentice (UK) saying 'This photo/poster has adorned my wall for some time. However neither I nor my friends can identify the rather handsome car with knock on wire wheels. Some say it's American; I think it looks European but have not found it on any of the books or web searches. The girls number would also be appreciated!' -- Finally cracked after being 'unknown' for some time! This is the back end of a cca 1947 Alfa Romeo 6C 2500 Freccia d'Oro (Golden Arrow). Fuzzy blurry photo received from Lanny Cotler (USA) who is trying to verify the date of a photograph. 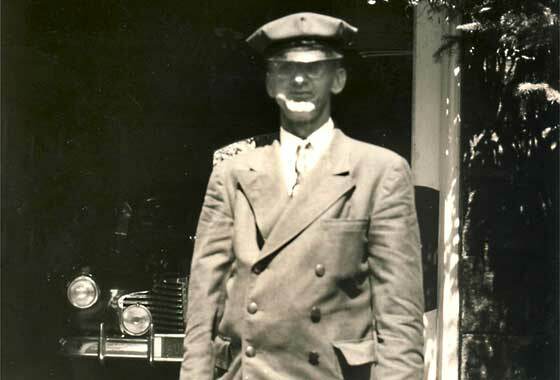 Can we tell him what make and year is, of the car in this photo blowup? He is guessing a '51 Cad. Maybe even a '52. But the owners of the photograph say it was taken in 1950." -- Our friends at the AACA advised that this is a 1950 Cadillac Fleetwood Sedan, as bumper guards were more bulbous on the later model years, hence the name "dagmars" . In 1951 they were more 'forward thrust'. Email from Richard Steel (UK) saying 'This is my father (who was a farmer) sitting in something stripped down (no spare). My father was a keen hill climb racer at Firle and Lewes Racetrack before the war. Photo probably taken early 1930s. -- Another that has done the rounds with no suggestions. Not Delage or Sunbeam. 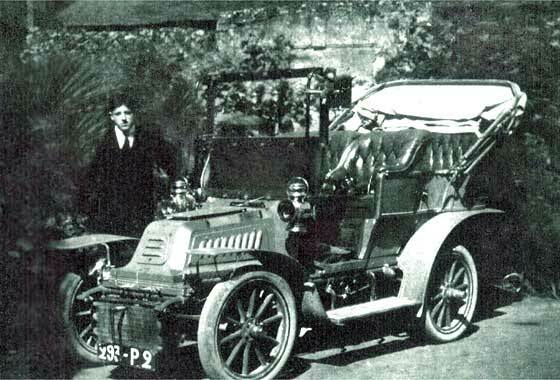 Smaller medium sized car of 1500ccs/2-litres, no earlier than 1914 and no later than 1924. Small rear brake drums is early feature. Body seems original to the chassis. Another photo received from Raoul Rainer from Stuttgart (Germany) from a batch of 1920s/30s photos he purchased on-line recently. Car was photographed in Germany. -- Raoul has given us many interesting teasers but this one has so far beaten all of our normal contributors. Many suggestions have been put forward, but none match. The body plate says built in Neustadt. Looks Teutonic but a good suggestion was that it might be a Zbrojovka built in Brno, Czechoslovakia. Probably not.